Male 2 ft. 8 in. +2d4 in. Female 2 ft. 6 in. +2d4 in. Goblins are a race of childlike creatures with a destructive and voracious nature that makes them almost universally despised. Weak and cowardly, goblins are frequently manipulated or enslaved by stronger creatures that need destructive, disposable foot soldiers. Those goblins that rely on their own wits to survive live on the fringes of society and feed on refuse and the weaker members of more civilized races. Most other races view them as virulent parasites that have proved impossible to exterminate. Goblins can eat nearly anything, but prefer a diet of meat and consider the flesh of humans and gnomes a rare and difficult-to-obtain delicacy. While they fear the bigger races, goblins' short memories and bottomless appetites mean they frequently go to war or execute raids against other races to sate their pernicious urges and fill their vast larders. Physical Description: Goblins are short, ugly humanoids that stand just over 3 feet tall. Their scrawny bodies are topped with over-sized and usually hairless heads with massive ears and beady red or occasionally yellow eyes. Goblins' skin tone varies based on the surrounding environment; common skin tones include green, gray, and blue, though black and even pale white goblins have been sighted. Their voracious appetites are served well by their huge mouths filled with jagged teeth. Society: Violent but fecund, goblins exist in primitive tribal structures with constant shifts in power. Rarely able to sustain their own needs through farming or hunting and gathering, goblin tribes live where food is abundant or near places that they can steal it from. Since they are incapable of building significant fortifications and have been driven out of most easily accessible locations, goblins tend to live in unpleasant and remote locations, and their poor building and planning skills ensure that they dwell primarily in crude caves, ramshackle villages, and abandoned structures. Few goblins are good with tools or skilled at farming, and the rare items of any value that they possess are usually cast-off implements from humans or other civilized cultures. Goblins' appetites and poor planning lead to small tribes dominated by the strongest warriors. Even the hardiest goblin leaders quickly find out that their survival depends on conducting frequent raids to secure sources of food and kill off the more aggressive youth of the tribe. Both goblin men and women are ugly and vicious, and both sexes are just as likely to rise to positions of power in a tribe. goblin babies are almost completely self-sufficient not long after birth, and such infants are treated almost like pets. Many tribes raise their children communally in cages or pens where adults can largely ignore them. Mortality is high among young goblins, and when the adults fail to feed them or food runs low, youths learn at an early age that cannibalism is sometimes the best means of survival in a goblin tribe. Relations: Goblins tend to view other beings as sources of food, which makes for poor relations with most civilized races. Goblins often survive on the fringes of human civilization, preying on weak or lost travelers and occasionally raiding small settlements to fuel their voracious appetites. They have a special animosity toward gnomes, and celebrate the capturing or killing of such victims with a feast. Of the most common races, half-orcs are the most tolerant of goblins, sharing a similar ancestry and experiencing the same hatred within many societies. Goblins are mostly unaware of half-orcs' sympathy, however, and avoid them because they are larger, meaner, and less flavorful than other humanoids. Alignment and Religion: Goblins are greedy, capricious, and destructive by nature, and thus most are neutral or chaotic evil. Adventurers: goblin adventurers are usually curious and inclined to explore the world, though they are often killed off by their own foolish misdeeds or hunted down for their random acts of destruction. Their pernicious nature makes interacting with civilized races almost impossible, so goblins tend to adventure on the fringes of civilization or in the wilds. Adventurous individuals who survive long enough often ride goblin dogs or other exotic mounts, and focus on archery to avoid close confrontation with larger enemies. 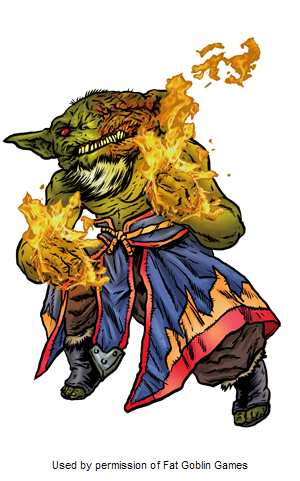 goblin spellcasters prefer fire magic and bombs over almost all other methods of spreading mayhem. If your GM is running a goblins-only campaign, you don’t have to worry about how your goblin character fits in with the rest of the group or with civilization. The vast majority of campaigns do not assume a goblins-only cast of player characters. Thus, if you want to play a goblin character, chances are great that you’ll be playing an outcast. Goblins don’t have to be evil maniacs—just because most of them are doesn’t mean your character is. In fact, playing a non-evil or even a good-aligned goblin can present some enjoyable and interesting roleplaying challenges. If you want to play a goblin because you’re eager to explore these challenges, or because you like playing strange characters against their stereotypes, or because you enjoy playing “monsters with hearts of gold,” then you’re on the right track for most campaigns. In such a case, you should look at the majority of the flavor in this book in reverse—you can define your goblin character by playing a character with values opposite of many of the things most goblins define themselves. Perhaps your goblin is a patient scholar who specializes in languages and is attempting to catalog the “true” history of the goblin race in a series of books. Maybe you’re a cavalier who seeks to use dogs or horses as allies because you’re convinced that the goblin fear of these creatures is one of your kin’s greatest failings. Or maybe you were rescued as a child by a kindly adventurer who then turned your care over to a benevolent religion and you grew up with not only a deep respect for one of the gods of purity but a sense of shame that most of your kind worship barghests and demons. None of this means you can’t still enjoy playing up some of the goblin race’s other quirks. Their ravenous hunger, their love of songs, their twisted senses of humor, and respect for nature are excellent traits that you can embrace as a goblin that don’t disrupt parties or derail adventures. You can still maintain these classic goblin personality traits without also being a distraction to the game itself. Talk with your GM about this before you decide to play a goblin PC. If the GM is okay with goblin player characters, he will be open to methods by which your goblin character can interact with non-goblin societies in non-disruptive ways. He might require you to be accompanied by one or two non-goblin friends who can vouch for you, or he might ask you to make a DC 10 or DC 15 Diplomacy check in order to convince locals to allow you to shop or visit establishments without calling the guard. Certainly you’ll need to be on your best behavior in these situations. In time, if your character spends several weeks or months in a town without causing problems, the locals will grow used to you and may even start treating you like a friend or neighbor. Playing a goblin also provides a character with the opportunity to be creative in the strangely charming and cleverly insane manners common to the race. Players of goblin bards (or fighters, or any other class for that matter) should consider this encouragement to spend some time composing their own goblin songs. Ability Score Racial Traits: Goblins are fast, but weak and unpleasant to be around. They gain +4 Dexterity, –2 Strength, and –2 Charisma. Type: Goblins are humanoids with the goblinoid subtype. Size: Goblins are Small creatures and thus gain a +1 size bonus to their AC, a +1 size bonus on attack rolls, a –1 penalty to their CMB and CMD, and a +4 size bonus on Stealth checks. Base Speed: Goblins are fast for their size, and have a base speed of 30 feet. Languages: Goblins begin play speaking Goblin. Goblins with high Intelligence scores can choose from the following: Common, Draconic, Dwarven, Gnoll, Gnome, Halfling, and Orc. See the Linguistics skill page for more information about these languages. Skilled: Goblins gain a +4 racial bonus on Ride and Stealth checks. Darkvision: Goblins see perfectly in the dark up to 60 feet. Cave Crawler Some goblins are born and raised in caves and rarely see the light of day. Goblins with this trait gain a climb speed of 10 feet and the +8 racial bonus on Climb checks associated with having a climb speed. Goblins with this racial trait have a base speed of 20 feet and lose the fast movement racial trait. City Scavenger Goblins who live within the boundaries of human cities survive by scavenging for refuse and hunting stray animals. Goblins with this trait gain a +2 racial bonus on Perception and Survival checks, and can use Survival to forage for food while in a city. This racial trait replaces skilled. Eat Anything Raised with little or no proper food, many goblins have learned to survive by eating whatever they happen across and can digest nearly anything without getting sick. Goblins with this trait gain a +4 on Survival checks to forage for food and a +4 racial bonus on saves versus effects that cause the nauseated or sickened conditions. This racial trait replaces skilled. Hard Head, Big Teeth Goblins are known for their balloon-like heads and enormous maws, but some have even more exaggeratedly large heads filled with razor-sharp teeth. Goblins with this trait gain a bite attack as a primary natural attack that deals 1d4 points of damage. This racial trait replaces skilled. Over-Sized Ears While goblins' ears are never dainty, these goblins have freakishly large ears capable of picking up even the smallest sounds. Goblins with this racial trait gain a +4 bonus on Perception checks. This racial trait replaces skilled. Tree Runner In trackless rain forests and marshes, it can be difficult to find dry ground to build on. goblin tribes living in such areas have learned to live in the treetops. These goblins gain a +4 racial bonus on Acrobatics and Climb checks. This racial trait replaces skilled. Weapon Familiarity Goblins' traditional weapons are the dogslicer and the horsechopper, weapons designed specifically to bring down their most hated foes. Goblins with this trait are proficient with the dogslicer and the horsechopper, and treat any weapon with the word “goblin” in it as martial weapons. This racial trait replaces skilled. When creating a goblin PC, with your GM’s permission, you may select any of these character traits, or even some of unique goblin spells or feats. Since some of these options work best with other goblins, not all of them are necessarily appropriate for a goblin PC. Alchemist The alchemist gains fire resistance 1. Each time this reward is selected, increase fire resistance by +1. This fire resistance does not stack with fire resistance gained from other sources. Barbarian Add +1/2 on critical hit confirmation rolls for attacks made with unarmed strikes or natural weapons (maximum bonus of +4). This bonus does not stack with Critical Focus. Bard Add +1 to the bard's total number of bardic performance rounds per day. Cavalier Add +1 hit points to the cavalier's mount companion. If the cavalier ever replaces his mount, the new mount gains these bonus hit points. Druid Add +1 hit points to the druid's animal companion. If the druid ever replaces her animal companion, the new animal companion gains these bonus hit points. Gunslinger Add +1/3 on critical hit confirmation rolls made with firearms (maximum bonus of +5). This bonus does not stack with Critical Focus. Oracle Add +1 on concentration checks made when casting spells with the fire descriptor. Ranger Gain a +1/2 bonus on damage dealt to dogs (and dog-like creatures) and horses (and horse-like creatures). Rogue Add a +1 bonus on the rogue's sneak attack damage rolls during the surprise round or before the target has acted in combat. Sorcerer Add +1 spell known from the sorcerer spell list. This spell must be at least one level below the highest spell level the sorcerer can cast, and must have the fire descriptor. Summoner Add +1/4 evolution point to the eidolon's evolution pool. These bonus evolution points must be spent on evolutions that deal fire damage or protect the eidolon from fire (for example, resistance, energy attacks, immunity, breath weapon, and so on). Witch Add +1 spell from the witch spell list to the witch's familiar. This spell must be at least one level below the highest spell level she can cast. If the witch ever replaces her familiar, the new familiar knows these bonus spells. The following feats are available to a goblin character who meets the prerequisites.